Coll. No. 1081, 23 Apr 2015, characters observed: Perennial, rosette to 5 cm. dia., flowering stems to 14 cm., not in alpine environment, eastern slope, hairs stellate throughout; Leaves, basal, rosette, 9 mm. × 6.5 mm., ovate, entire, petiole, 12 mm., cauline, 10 mm., appearing secund, narrowly oblanceolate; Inflorescence, exceeding leaves; Pedicels, in fruit, ascending; Fruit, 5 mm. × 2 mm., ovate-elliptic, hairs stellate, apex entire (not notched, although these immature). Field Notes: Coll. No. 1081, 23 Apr 2015. 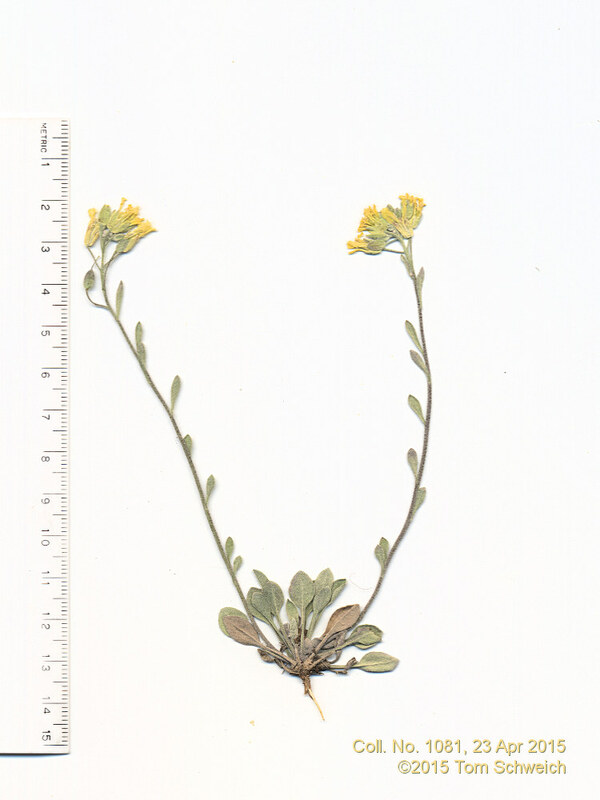 Other photos about Species - Brassicaceae or Brassicaceae Physaria montana.